It’s been a while since I’ve had a story published in Chicago Parent Magazine, but when the editor asked me to write about Chicago Children’s Theatre’s move to it first permanent home, I jumped at the chance. My experiences with this company have been overwhelmingly positive. You can find the story in the October issue of Chicago Parent. When Chicago Children’s Theatre opens its newest production “Harold and the Purple Crayon,” it will be the premiere show in its first permanent home. After operating on an itinerant basis for its first six seasons, the company recently announced its designation as Artist-in-Residence at the Ruth Page Center for the Arts. “We are so glad to be in residence at such an iconic Chicago theater,” says CCT Artistic Director Jacqueline Russell, who hopes to continue the streak of successful companies such as Lookingglass and Chicago Shakespeare Theatre, both of which called Ruth Page home. Ruth Page is not completely new to CCT’s audiences. In fact, the 2010 production of “Jackie and Me,” an outstanding look at the life and achievements of Jackie Robinson, was produced at Ruth Page. The location at 1016 N. Dearborn offers a neighborhood feel, plus convenient parking. “For families, an evening of theater is much more than the actual show. It’s a complete experience. Parents need to know where to eat and where to park. Having one location for all of our shows will allow us to build our audience base,” she says. Russell also admits that having a single spot will mean the company can spend more time focusing on producing instead of securing a venue for each show. This is great news for local families, as CCT has already established itself as one of the city’s best children’s theaters. The Ruth Page theater space lends itself well to the kind of intimate work for which the company is known. In keeping with the “complete experience” theme, on Thursday evenings families can arrive early (5:30 p.m.) for a pre-show pizza party, compliments of Pete’s Pizza and Izze. Friday evenings are pajama parties where guests wear their PJs and take part in pre-show activities, plus a chance to meet the cast after the show. As for the upcoming production, families can expect “Harold and the Purple Crayon” to engage all of their senses with music, puppetry and animation to tell the story of a boy who uses his imagination to create his own world. “One of our challenges in designing this show was to be true to Harold’s world. Everything created for this production has to look like it came from a purple crayon. I think audiences will be amazed at what they see,” says Russell. Russell expects Harold to inspire children and parents to use their imaginations not only to create something new, but to solve problems. Now that she has secured a good home for her company, she can focus on continuing to hire the best actors, designers and directors for every show. This article appeared in the October 2012 edition of Chicago Parent. I was thrilled to return to Chicago Shakespeare Theater last weekend for the press opening of their Family Series production of Disney’s Beauty and the Beast. My review will be published in the August issue of Chicago Parent as well as ChicagoParent.com. Chicago Shakespeare Theater has built its reputation on excellent quality productions reflecting Shakespeare’s love of storytelling, language and human emotion. That has carried that through to its Family Series as well. When I learned that CST chose to premiere the 70-minute version of Disney’s Beauty and the Beast for the summer children’s show, I was unsure how it fit the mission. However, after seeing this beautiful production, I’m more convinced than ever that CST is a best bet for families. With a cast of only 16 people, they managed to provide the feel of a full-scale Broadway musical. Outstanding voices and swift choreography set the mood. 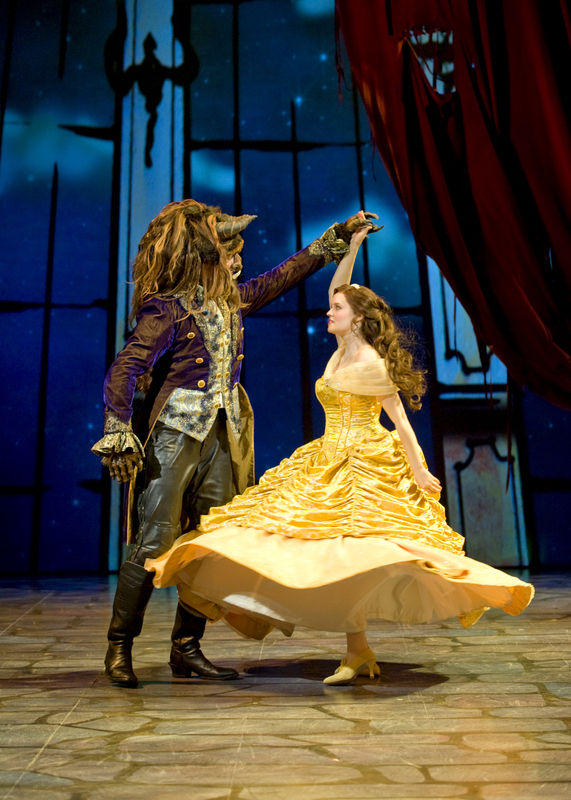 Dynamic costumes and an ever-changing set complete with computer-animated graphics bring the enchanted world of Belle and Beast to life. In fact, the scenes in the forest with wolves attacking and fog rolling through were so realistic that some young audience members cried out to leave. That’s certainly testament to human emotion. Emily Rohm is perfect as the inquisitive, feisty and beautiful Belle. She brings something fresh to the well-known character, captivating the young girls in the audience. William Travis Taylor (Beast) and Jake Klinkhammer (Gaston) provide the perfect counterparts in the quest for her love. Klinkhammer makes Gaston’s smarmy and conceited villain the show’s comic relief. Taylor has the challenge of conveying Beast’s emotional journey through an intricate mask and mass of beastly hair. Using his voice and body language, he succeeds. Once again, director Rachel Rockwell keeps the pace of the show and its ensemble members moving quickly. She milks the comedy, but doesn’t shy away from the romance inherent in the story. My 10-year-old son thought there were “too many slow songs” but, judging by the reaction of the audience, he was in the minority. Girls and boys alike were lined up in the lobby after the show for their chance to get an autograph from, and picture with, some of the actors. You can read more of my stories at Chicago Parent. I never pass up the chance to visit great hotels. It’s most certainly the best perk I’ve experienced as a writer. My sons have had the opportunity to be pampered at some of Chicago’s best locations. But I have to admit, one of the city’s oldest hotels holds a special spot in my heart. I originally wrote this story for the June 2012 issue of Chicago Parent. I have added more personal stories and pictures for this post. 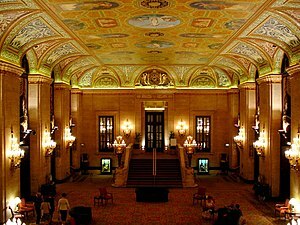 Stepping into Chicago’s Palmer House Hilton is like stepping back in time. This hotel’s walls have seen the city’s booms and recessions, its glamour and its vice. Just walking the halls, looking at photos and reading plaques can give visitors a sense of Chicago’s last 100 years. But actually staying as a guest envelops you in another era, a time when Chicago’s Loop was THE spot for dignitaries and Hollywood elite. Palmer House treated my family to an elegant overnight this spring. While my husband and I are big fans of Potter’s Lounge, neither of us had ever stayed over as guests. While we checked in, our sons marveled at the ornate decor and the hotel’s grand scale. They immediately climbed the stairs to watch us from the balcony-which is how they spotted the lobby’s iPads. This juxtaposition of old and new allowed me to sit back and imagine myself as Jane Russell while they sat back comforted by Internet access. The same was true once we entered our gorgeous suite. The furnishings have a very Art Deco feel (a chaise lounge in the living room), but all the latest technology. They were docking iPods before I had unzipped the suitcase. The hotel had booked us in a gorgeous suite with an adjoining room for the boys so we all had plenty of space. Palmer House has, in fact, modernized and renovated much of the hotel for guests’ comfort. We truly could have hosted a cocktail party for 40 people in our suite with the enormous table and wet bar. Instead, we spread out and enjoyed the view. We were excited to use our “Executive Privileges” (well worth the additional nightly cost) so we headed toward the special executive elevator. 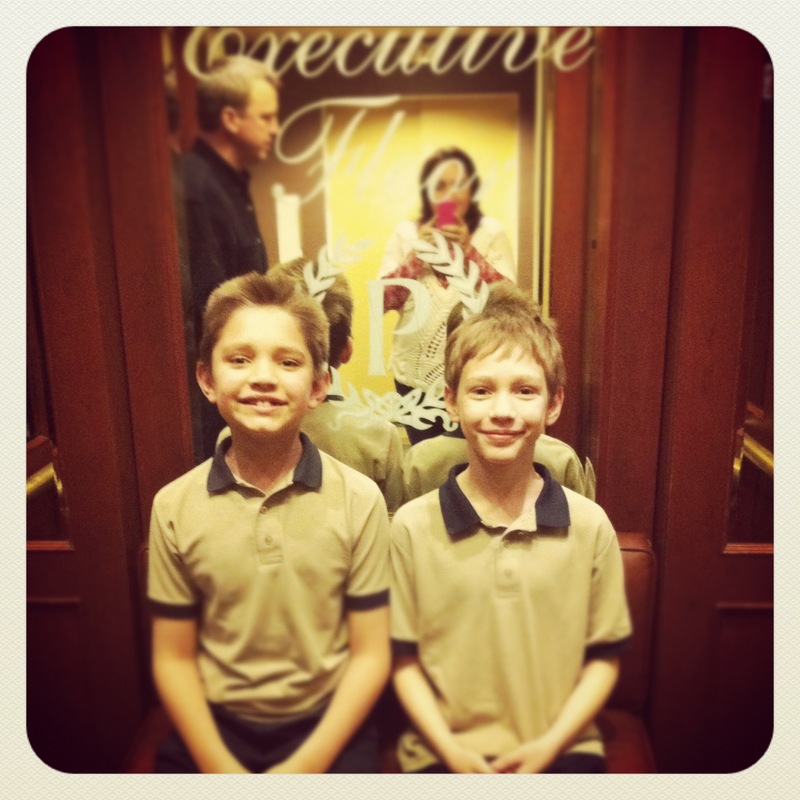 My older sons were over the moon with excitement about the keyed elevator with its etched mirrors and folding bench. Who doesn’t like to feel special? $60 is a small price to pay for the privilege of a private elevator and access to the fully stocked Executive Lounge. On Saturday we arrived in time for the cocktail hour with hot and cold appetizers as well as unlimited sodas & waters. After exploring the Lounge’s nooks & crannies, the boys settled in at the computers while my husband & I settled in with drinks and gorgeous views. In the Lounge and in the halls, my husband and I kept stopping at the dramatic photos of the superstars who had stayed or entertained at the Palmer House back in the day, from Rat Packers to Benny Goodman and Jack Benny. I had no trouble imagining us back in the day, dressed in our finest attire, out for a swanky evening in the city. With all the hotel’s amenities (including the intimate pool and state-of-the-art gym/spa), I would have been content to never leave. After a delicious and satisfying complimentary breakfast buffet in the Executive Lounge, we spent the morning at the pool. The hotel’s late check-out time gave us more time to explore the hotel’s ground floor, its famous peacock doors and the lobby’s ceiling mural. poolside in January. Palmer House Hilton. In fact, a month or so after our visit I sent a message to Palmer House that my nine year-old had been asking me to return to the “peacock door hotel.” The management responded with a kind note and a small stuffed peacock. He was, of course, thrilled with the special present. I was thrilled that he remembered such a lovely detail from our visit. Not every mom gets to offer those kinds of memories as a part of her job. 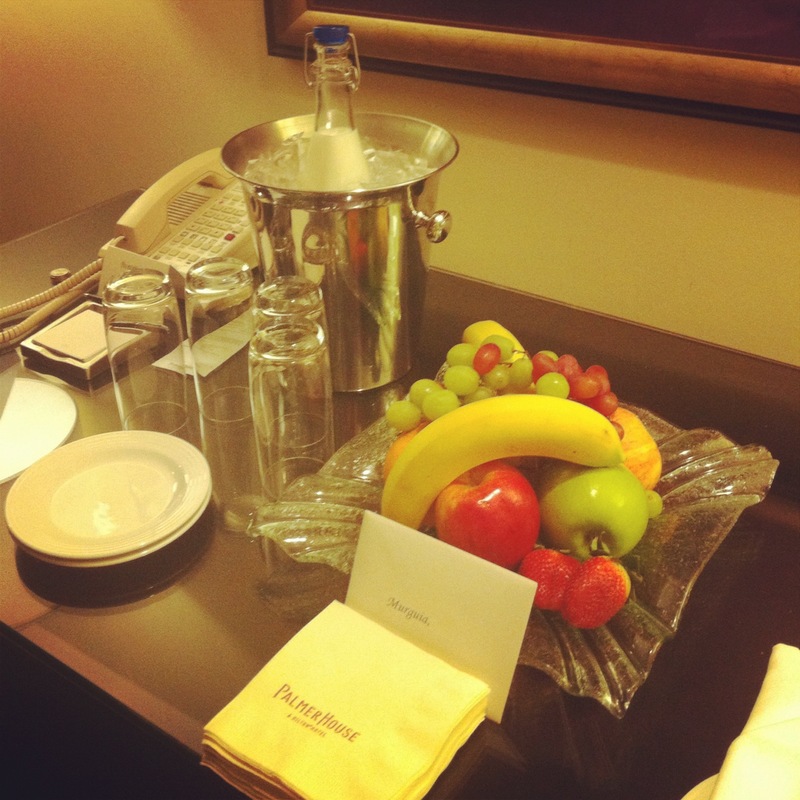 We definitely return to Palmer House for a night in the City. Disclosure: My family was not charged for our stay at Palmer House and I was paid by Chicago Parent to write the article. I sometimes receive complimentary services and gifts, but I choose to write only about places I believe will be good for my readers. All opinions expressed are 100% my own. To see the original version of this story plus more of my adventures with my sons, please visit Chicago Parent. Giddyap! Little Boots Rodeo is this weekend! 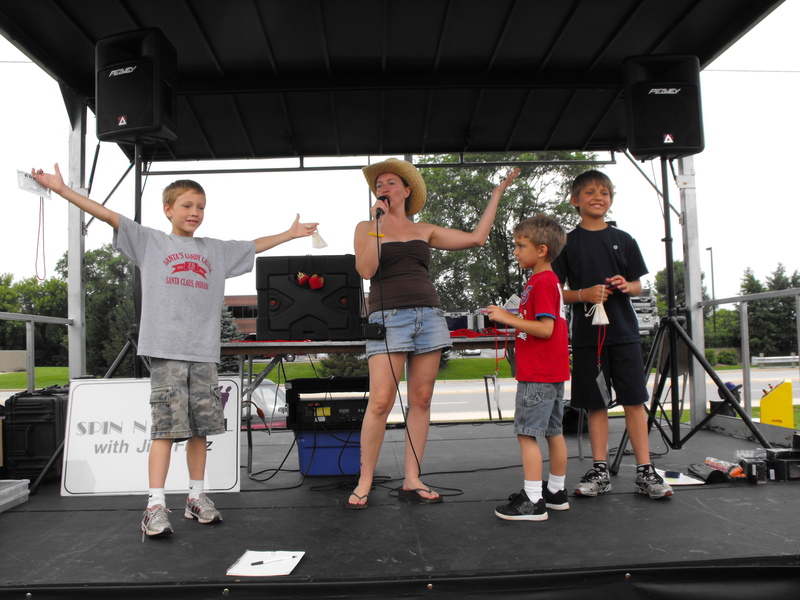 My city boys are not exactly horse wranglers or bull riders by nature, so, last summer, when I heard about Little Boots Rodeo in Elk Grove Village, I was skeptical. How would my kids compete in barrel racing and cow milking? Well, as it turned out, quite well. This Saturday and Sunday, June 23rd & 24th, little buckaroos age 3-12 can register to “compete” in 12 rodeo-themed events. Participants who complete all events receive an award certificate. The events are all adapted for kids so the “lasso” is actually a ring toss and the “horse race” takes place on a hobby horse. 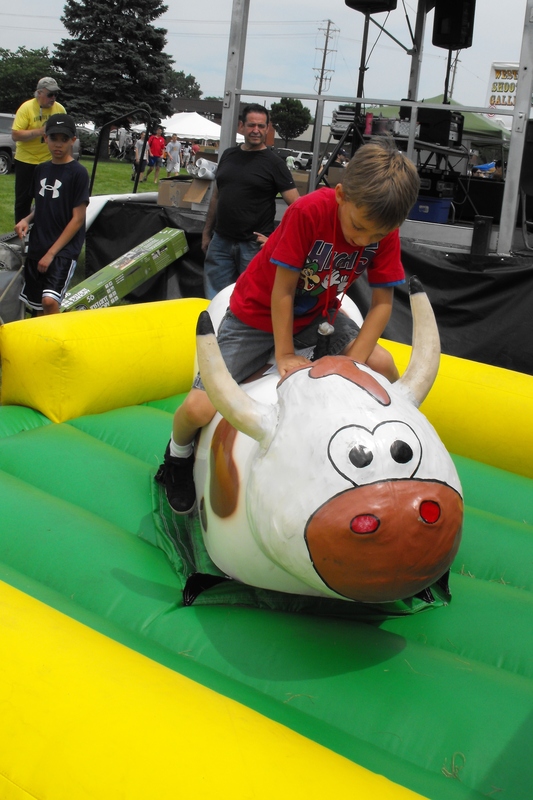 My older sons were drawn to the mechanical bull “bull riding” and plastic “bow and arrow” competitions. It’s a great mix of activities, appealing to families with kids of different ages. Since this is a feel-good festival, all children walk away winners, no matter what their skill level. bull riding — two different sized bulls for different ages. Even if you don’t want to participate in the rodeo events, Little Boots offers a day’s worth of entertainment. Magic shows, costumed characters and professional cowboys all add to the rodeo atmosphere. 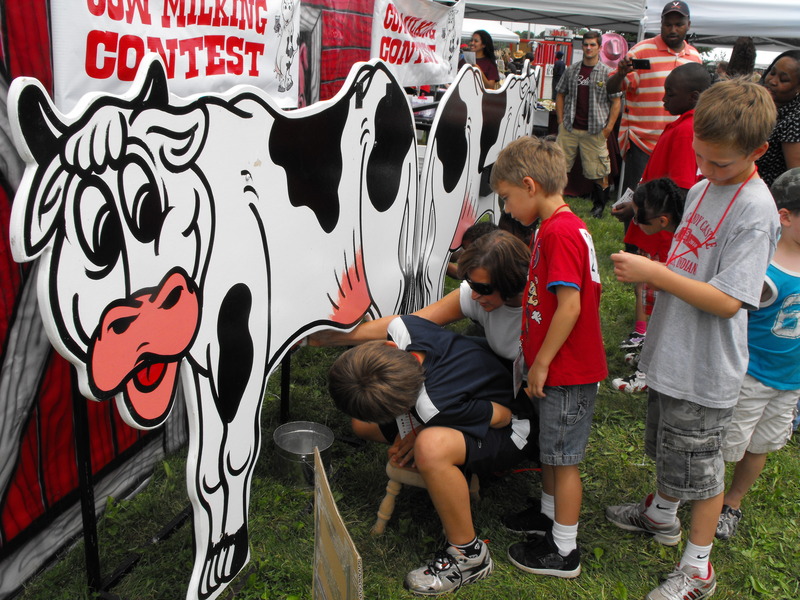 Kids can take a chance on both duck and pig races, or pet a variety of farm animals in the Petting Zoo. Many children dressed in full cowboy gear and throughout the day received “Best-Dressed” awards. “One of the main goals of the festival is for children to experience something that they have never done or seen before,” according to Little Boots’ Director Jack Groat. 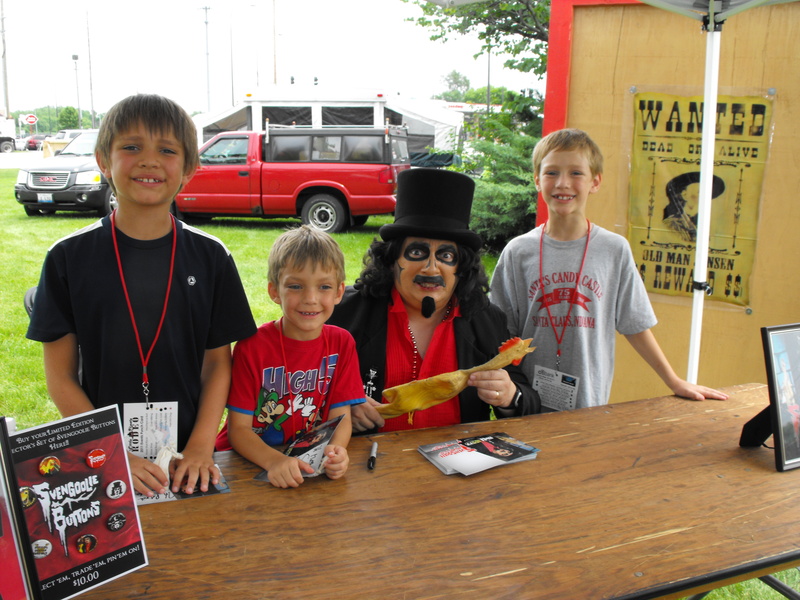 Toward that goal, they are adding more events: watch a man being shot from a cannon, take a camel ride, or visit “The Lion King.” Last year we met Svengoolie, who’s scheduled to return again this weekend. We missed the duck races, but I hear Groat and Elk Grove Village’s mayor have a friendly wager going. Admission to Little Boots is free, although Groat asks that everyone bring a nonperishable food pantry donation. Participants pay $10 each to do all 12 rodeo events and some attractions do have minimal charges. All proceeds from the rodeo benefit local charities. Last year, Little Boots donated $12,000 to charities in the north and northwest Chicago suburbs. All children who complete the events have their names announced and receive certificates. This original version of this article appeared in the Summer 2012 edition of Going Places. I have added copy and photos for this blog post. 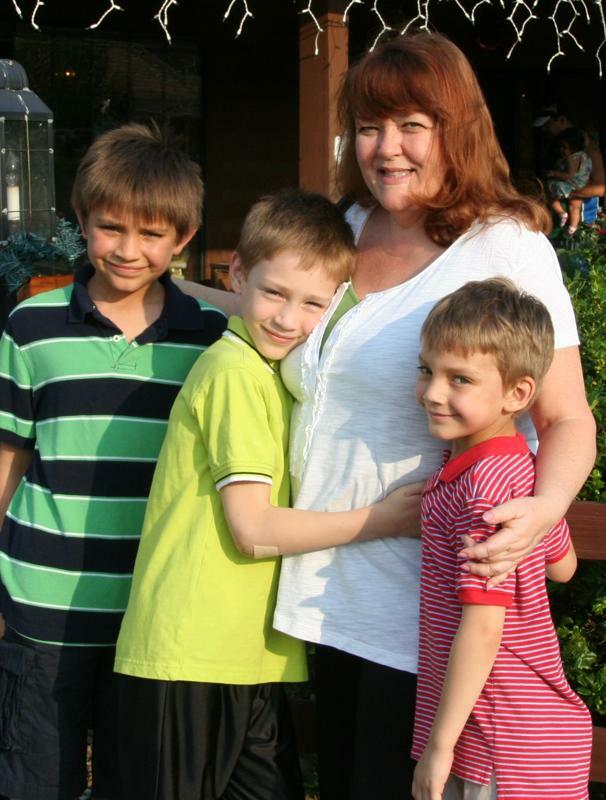 You can find more of my adventures with my sons at Chicago Parent. My sons and I try to spend as much time as possible exploring the city, especially in the summer. Lunch can be a problem, though. If I don’t want to spend obscene amounts of money, it seems like we end up eating the worst kinds of fast food. But recently I discovered a much better option at Freshii. I have never experienced fresher food on the go. 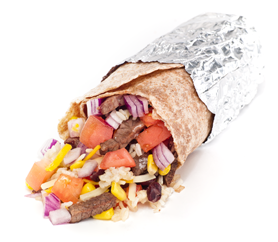 With wraps, salads and soups all made to order, it’s a perfect spot to pick up items for a picnic or bench lunch. 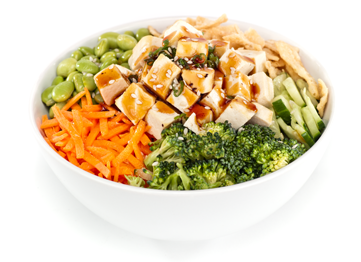 While Freshii has some standard menu items, it also uses a “build your own” format so you can choose a soup bowl, noodle bowl or wrap and personalize it with your three favorite toppings. The focus is on ingredients low in fat but high in fiber and vitamins. Portion sizes are kept moderate, but so is the price. Since Freshii recently unveiled a low-price kids’ menu, my sons and I took advantage of the Water Tower Place location to sample the offerings. Starting with the basic teriyaki noodle bowl, my 11-year-old dressed it up with cilantro, tofu and even some red pepper flakes. I’d love to say I tried it, but he ate every bit. My other boys stuck with the standard chicken soup and quesadilla lunches and found them both delicious. These meals cost under $6. Though I’m not even a vegetarian, I decided to try the vegan wrap (in the spirit of healthy lunch). It was really delicious, filled with enough flavor and texture to make a satisfying lunch. Freshii has also taken a stand to eliminate much of the paper and plastic waste associated with take-out food. Packaging is trimmed down, and you’ll have to remember to grab utensils and napkins if you need them, because they won’t automatically be thrown in with your order. 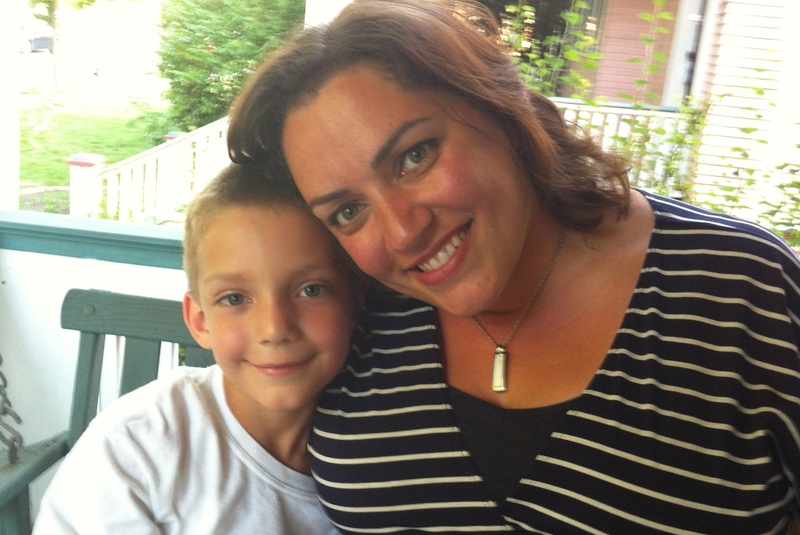 This article originally appeared in the June 2012 edition of Chicago Parent. You can find more of my restaurant reviews there. 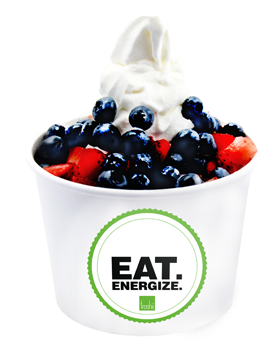 I have added photos from Freshii’s website for this blog post. Disclosure: My family was not charged for our meal at Freshii and I was paid by Chicago Parent to write the article. I sometimes receive complimentary services and gifts, but I choose to write only about places I believe will be good for my readers. All opinions expressed are 100% my own. I don’t like “good-byes” but I do like a good party. Last night I had the chance to say goodbye to many of the friends I’ve made over 20 years with the same company. These pictures don’t come close to capturing all the love and support I’ve felt, but they do show what a good time we had. 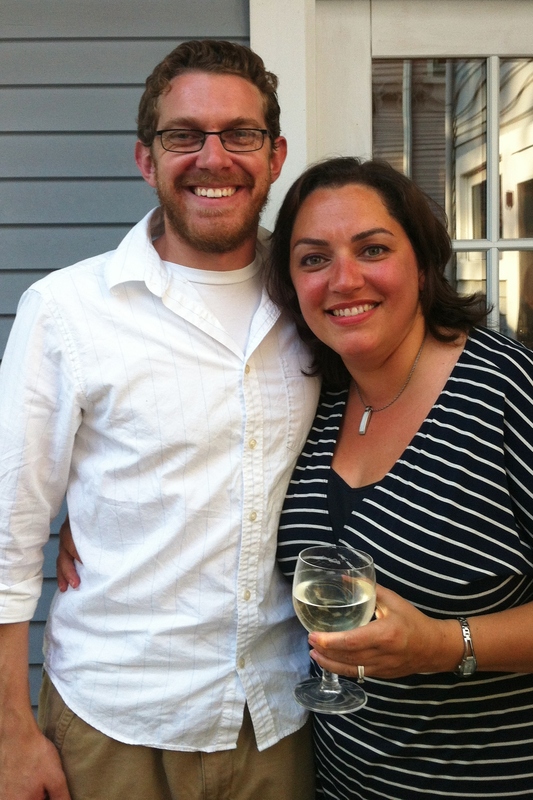 I will be ever-grateful for everything I learned about myself, about writing and about pushing forward during my time and many, many jobs at Wednesday Journal, Inc.
With Graham, a fellow “grew up in the company” friend. Wit & sarcasm, balanced with a fun-loving spirit and the tech savvy I needed I often. With Patti, my former boss & long-time friend. She inspires me to push beyond my comfort zone. Plus she could teach a course in Pep Talks. 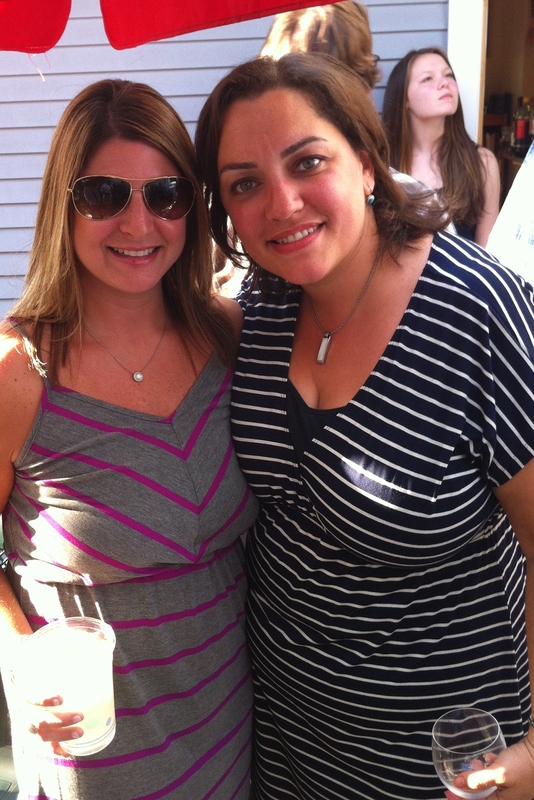 Kim and I in stripes. 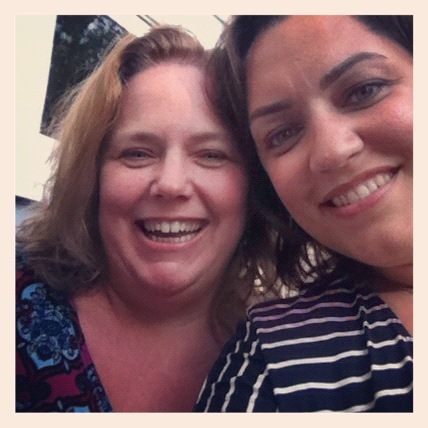 I would have never predicted what great friends we’d become when she first started at CP. 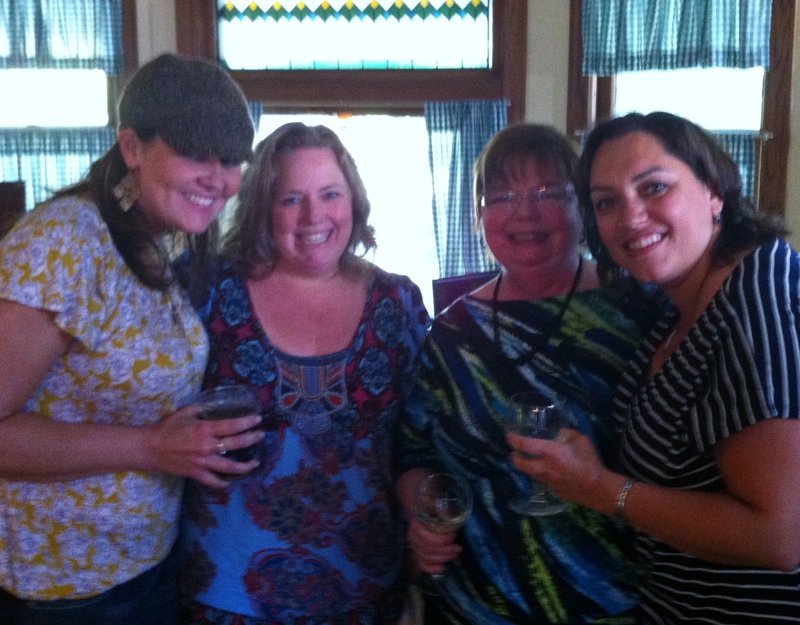 And, of course, my family by my side. Thanks little buddy. I want my Mommy, not my sons’ Mima. Today I leave for a long weekend with my mom. It’s our Mothers Day present to each other. No kids, just each other for a quick getaway. I’m more excited than I can express. I will miss my husband and sons but will treasure a couple of days on my own. Besides, I adore time alone with my mom. In celebration, I am sharing an essay I wrote in 2004. This essay was published in the May 2004 issue of Chicago Parent magazine. I wrote it before I had my third child. My world was so different, but the sentiment remains. I hope you enjoy this post and I wish much happiness and love to all the mothers and grandmothers out there. How can I be jealous of Mima time? It’s been three years since my older son’s birth and I still have a hard time believing that Mother’s Day has anything to do with me. As each May approaches I consider ways I can make the day special for my mom. Since I have toddlers, going out for a crowded brunch is not a relaxing idea for anyone, so I host a brunch at my house. I prepare all week-carefully choosing a menu, thoroughly cleaning our house, arranging beautiful flowers, setting the table with china and crystal. My friends think I’m crazy. Aren’t I supposed to be taking the day off? But she’s my mom, my best friend. For almost 30 years she was the most important person in my life. I want this lovely day for both of us. So the stage is set. The music is playing. In she comes, full of compliments about the table setting and delicious aromas. But before I can even offer her a cup of coffee, my boys are clamoring for all of her attention. They drag her off to the playroom where she happily builds animal parades, puts together puzzles and colors pictures all morning. I watch from the dining room because when “Mima” is over I’m pretty much invisible anyway. I marvel at what an amazing grandmother she is, especially considering that she doesn’t come close to fitting the gray-haired, cookie-baking mold. But she excels in the endless gifts, pockets full of candy and zero discipline departments. It is no wonder my sons adore her. I know I shouldn’t complain. My children are lucky to have her. I’m lucky to have her. I still can’t help feeling the twinge of resentment when she takes their side over mine. The issues are minor-candy before lunch or one more video before leaving- but still…aren’t mothers supposed to defend their own children above all else? How did I become the odd mom out? She would argue that by “occasionally” siding with the boys she is supporting me, because her attention and spoiling take some of the pressure off of me. And she would be right. As much as I might resent her apparent shift in loyalty, I depend on her presence in our lives. In fact, it’s rare if the boys and I go a whole week without seeing her. We generally spend Saturdays on “Mima adventures,” which might be a trip to the conservatory, museum or even an amusement park. I was so disappointed, not just at the realization that I was not the only light of my mother’s eye. I also wanted her to share in my excitement over having a couple hours with no crying, diapers or spit-up. As the boys have grown, she’s acknowledged my need to just be with her alone. Still, I’m more careful to warn her in advance when it will just be me. It saves us both the initial disappointment. It’s strange that becoming a mother in no way diminished my need for my mother. I thought it would, like a membership to some exclusive club of strong, self-confident women. If anything, motherhood makes me more aware-emotionally, intellectually and physically-of the job she has done. I wonder if it’s true that we all turn into our parents. It’s hard to believe at this stage. I remember the mom of my childhood as being fun, filled with ideas for outings and art projects, never disciplining us or raising her voice and always, always keeping us neat and clean. It’s with these ideals in mind that I strive to be a great mother. I can’t help making the comparisons between us. To my mom’s credit, she rarely offers unsolicited advice on how to parent. She listens and sympathizes, offers alternatives when I’m frustrated, and praises often. In other words, she mothers me. I’m sure that with each passing year, Mother’s Day will begin to feel more real to me. I will continue to watch my mother and my children share an unbreakable bond, probably continue to be envious. But I’ll also know that I am a link in that chain, adored by both generations. I can sip my coffee, surrounded by crystal, china and lovely flowers, knowing I receive the ultimate Mother’s Day gift every day. I am loved.